When I began planning my Seychelles trip, a lot of people told me that it is going to be really expensive. After they heard that I am going here for 15 days, they further tried to scare me and the information online certainly didn’t help my case. However, after staying here for 15 days now I can easily say that this African country doesn’t have to be an expensive vacation at all. Yes, the accommodation here is slightly costly but apart from that, everything is considerably priced and you need to be just a little smart to save yourself from unnecessary spending. If you are hoping to not compromise on your comfort at all, then I would suggest you not to read further because traveling on a budget requires a few compromises. For everyone else, I hope this helps you in planning your own Seychelles budget trip. One major rule of saving on travel is to book tickets in advance. Because then you get a lot of options to choose from. Also, flights are cheaper when you book them 6-7 months prior to your journey. You also might just stumble upon a good flight deal or offers so always be on a lookout for a flight deal. I found a great flight deal (Mumbai – Seychelles – Mauritius – Mumbai for 49k INR) some 8 months before the journey which is how I ended up in Seychelles. Another important thing to remember is never to book the flight from the first website that you come across. Research a little and check out different dates and cities. Also, make sure you compare different flight websites before actually booking. I started by checking the flights on Ixigo.com and then moved to kiwi.com. Finally, I came across CheapOair where I got a great deal for Air Seychelles flights. So, make sure you do the same and always check different websites before you finalize your booking. I cannot stress enough how important it is that you reserve a place which won’t ask you to make the pre-payment or will levy cancellation charges on your booking. Sometimes, you might come across better deals nearer the trip which will make it difficult to cancel if you have already paid for your room. So, search thoroughly for the best deals and don’t finalize anything before. Take your time and book the one which will cost you the cheapest. I used Booking.com to reserve my hostels but canceled them later when I found a better deal which helped me save some 5000 – 6000 INR. 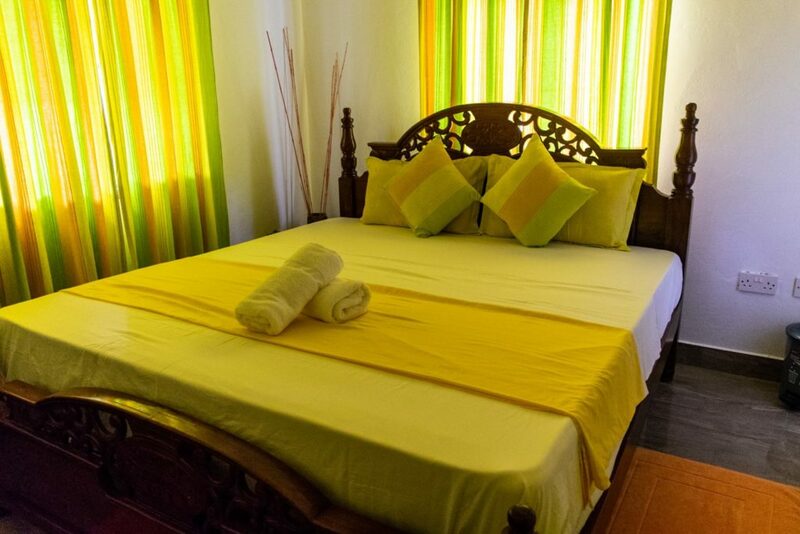 Another way to save some money in Seychelles is by finding a reliable Couchsurfing host. Although it won’t be easy because there aren’t a lot of people in Seychelles who participate in Couchsurfing but you still might find someone who could let you stay on the Mahe island at least. This way, you will not only save a few days’ living expenses but will also have someone to guide you through the island. I saved around at least 15-20k INR this way which was a great relief for me. Also, if you are lucky then they might even show you around and take you to the best places to eat or partay!!! If you can’t secure a Couchsurfing host then the next best thing would be to book a self-catering apartment or a hostel. These places will often include breakfast and water supply which can help you in reducing your food and water costs. Also, some of these places also have a shared kitchen space that you can use to cook your own food. This is definitely a great way to save some money and eat delicious, healthy food whenever you want. Avoid using taxis or cabs because they are obviously going to cost a lot. 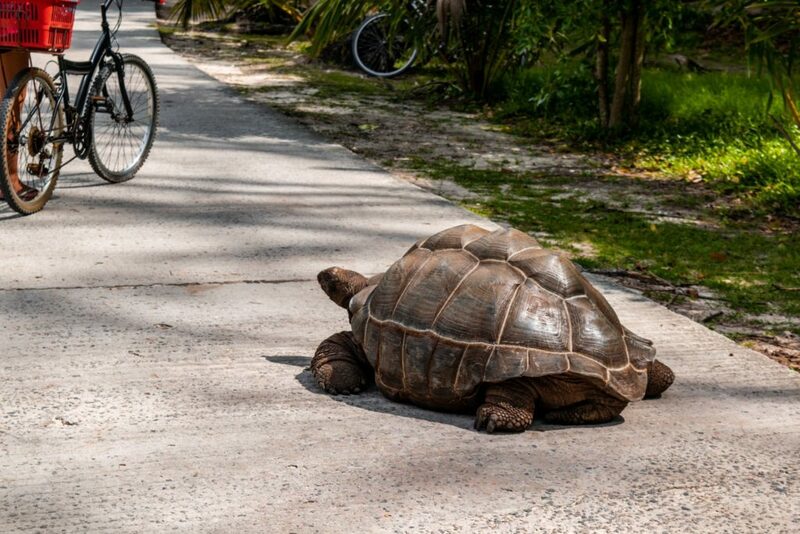 Instead, use Seychelles local bus transportation or hire bicycles. 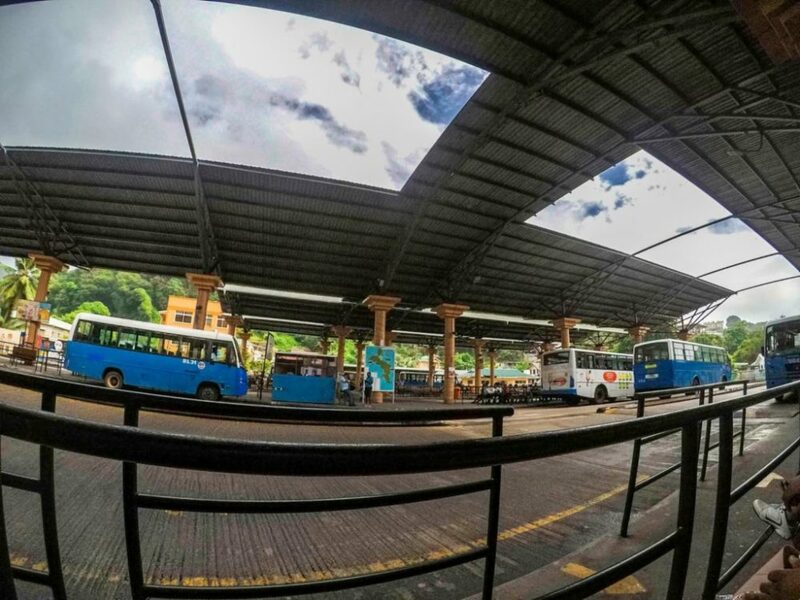 Both Mahe and Praslin are well-connected by buses and charge 7 Seychellois Rupees (35 INR) for a stop (This means you can get down at the last stop or the next stop but you need to pay just 7 Rupees for the entire bus ride). Trust me, taking the buses is the best way to travel and you see a lot of the island but the timing can be an issue. The last bus usually leaves at 7.30 – 8 p.m. in Mahe and 6.30 p.m in Praslin so you have to be careful. Also, always keep a bus schedule with you to be aware of the bus timings. One important thing to keep in mind is that if you are trying to keep a low budget trip then you can’t eat in any fancy place or high-end restaurant. If you do then you would easily end up losing 500-700 Seychellois Rupees (2500 – 3500 INR) in a single meal. That’s right, it’s a lot. 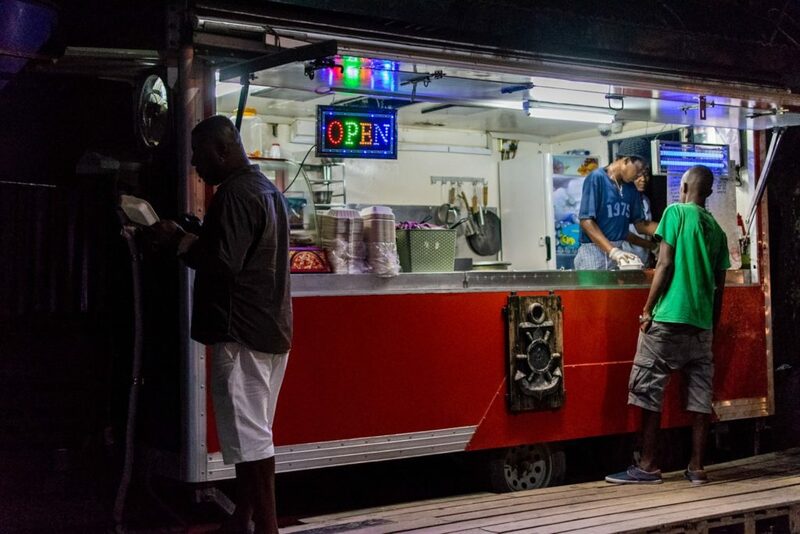 Instead, opt for takeaways which are considerably cheaper and will cost you 35-50 Seychellois Rupees (175 – 250 INR) for a meal. There are several takeaways all over the islands so you won’t face much of an issue. You can also get some fruits from the local market or some snacks from the grocery store to munch upon as it tends to be slightly cheaper. Note: Do try Octopus Curry if you are a non-vegetarian. One important thing to remember when traveling to Seychelles is that if you book your ferry online for Praslin and La Digue, then you are probably going to end up spending approximately 128 Euros (10,500 INR) for it. However, if you get some local person or hostel manager to book it for you then you could end up reducing it to 100 Euros (8300 INR) or even less. They usually don’t check your passport at the Jetty area so this could be a good way to save some bucks. If you want to save money on food then the best way would be to carry some food packets from your home and prepare your own food. You could take ready-to-make packets of soups, vegetables, etc. 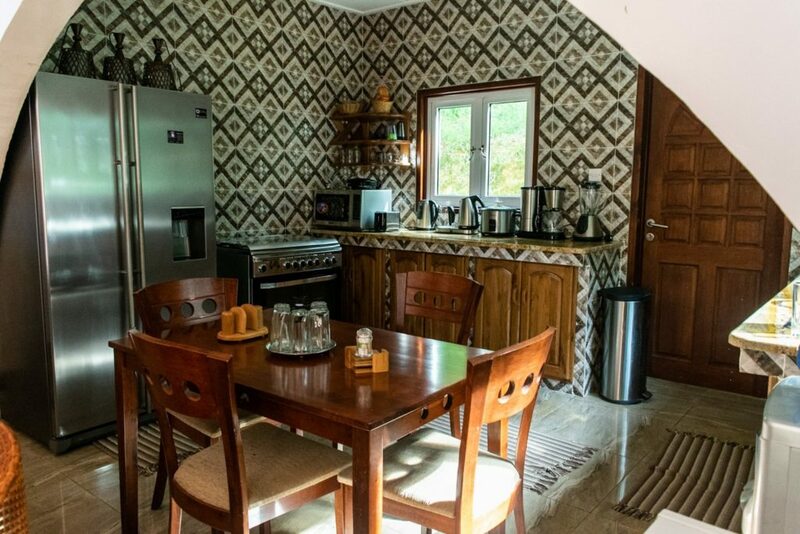 Or if you have opted for a self-catering guest house then you can buy local raw material and just prepare the food. Trust me, preparing your own food is always cheaper than takeaways too! I took several soup packets which worked well for my lunch and several other snacks too which cost me just 500-600 INR and were a great way to reduce some food cost. The thing about Seychelles is that you would find here numerous activities that won’t cost you a penny. Yes, that’s right! There are no Entrance fees or Parking charges. You just need to reach your destination and enjoy. Apart from Water Activities which can cost you a lot (Scuba Diving – 100 Euros = 8300 INR, Snorkeling – 25 Euros – 2000 INR), you have many things to do here. 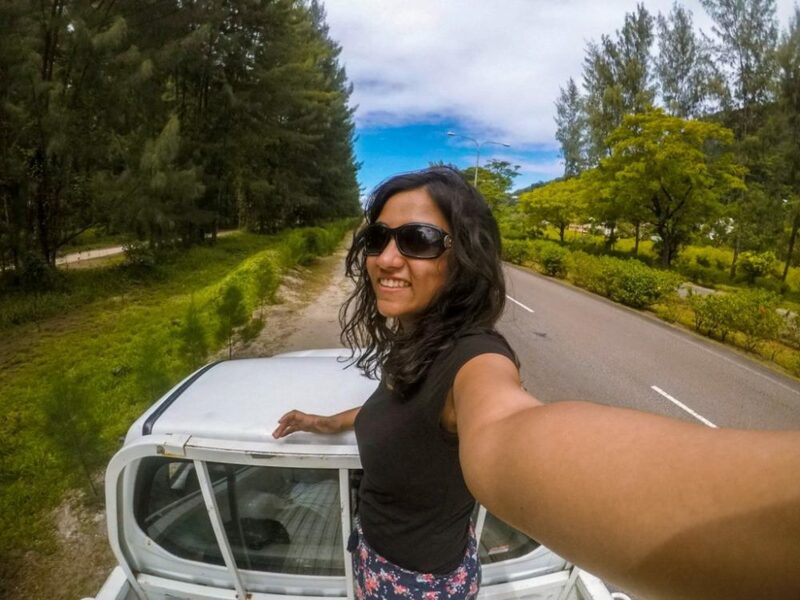 You can chill on numerous beaches, explore the Victoria city, watch or party at the Galle Face, cycle through La Digue, hike through the Morne or Glaud trails, hike through La Digue beaches, and so on. There are endless ways to enjoy yourself and explore the place without having to pay a hefty price for it. Yes, yes, yes! One of the best ways to save some money is by limiting your water purchase. No, I don’t mean that you should stop drinking water and dehydrate yourself but what I actually mean is make use of the free drinking water. If you are hiking in the mountains, then fill up your bottle with the waterfall or stream water (The Seychelles government does the same.). Also, if you are staying in a hostel where they provide you with water then make use of it and fill up your bottle every day before heading out. This will help you in saving at least 100-200 INR daily. Apart from buses, you can either hire a cycle or walk around to explore the places. Places like Victoria city, La Digue, etc. can easily be covered on foot. Praslin is just 12km in length so you can hire a bicycle here to explore the island. Please Note: Cost for a cycle for a day in La Digue can range from 100 – 150 Seychellois Rupees (500 – 750 INR) depending on the place where you rent it from. A lot of times you will come across different water bottle price ranges and will wonder what kind of sorcery is this. Well, don’t worry because there is a simple way to ensure that you purchase the cheapest bottle of water. A lot of grocery stores don’t keep these cheap bottles because they don’t get any profit on it. So, instead, they will sell you bottles which cost 10 – 15 Seychellois Rupees (50 – 75 INR). You can avoid this scam by simply purchasing a bottle at a local takeaway or street shop. Here, you will get a bottle of water for 6 Seychellois Rupees (30 INR) so you end up saving a lot of money. Seychelles is the perfect place for hitchhiking and can be great for reducing your transportation costs. While buses are cheap here, you can further cut the cost by hitchhiking with the locals here. Most of the locals are quite friendly and will offer you a ride if you are going in the same direction. So, make use of these opportunities and save some bucks while making a new friend in the process. Trust me, it is completely safe and amazing so don’t be afraid to try it. Also, people are really sweet here and will always help you out when you need it so don’t worry. I am not kidding. Internet charges in Seychelles are pretty high and can easily end up costing you somewhere around 2000 – 3000 INR if you aren’t careful. If you aren’t a social media junkie then kudos to you, my friend, you are going to save a lot. You can completely skip purchasing the Internet pack because you won’t need it while traveling on the buses. Just download the bus schedules and routes beforehand and you are all set to go. Although, if you really need internet then you can just hang out at the Victoria Bus Terminal. Make use of the free WiFi which is available for 15 minutes. You can then reconnect and keep using the WiFi as long as you wish. I lost some 4200 INR due to this Internet scam which could have certainly been avoided. Also, if you purchase a sim card then go for Cable & Networks as they have more Internet pack options. Seychelles is not an expensive country and is quite backpacker-friendly if you know how to cut the costs. I was easily able to complete my entire trip of 15 days in just 48,000 INR. This is not a lot if you think how amazing this place is. 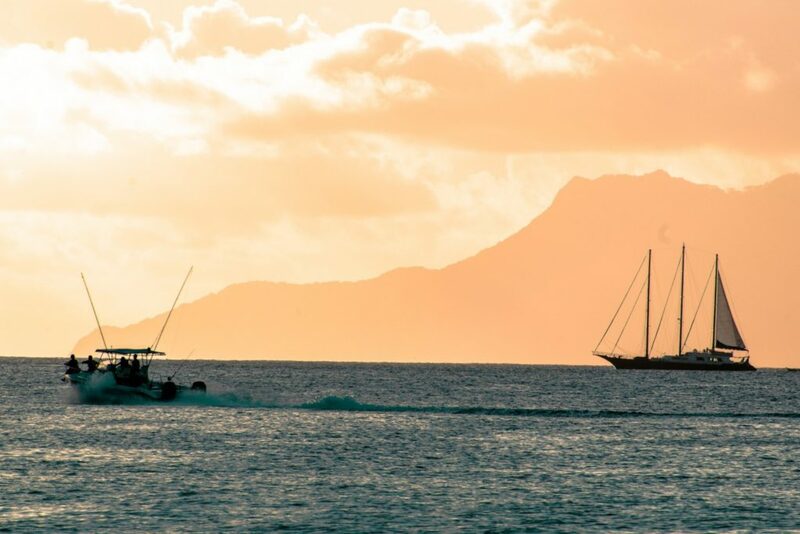 So, just follow these tips and you can plan an amazing budget-friendly trip to Seychelles too!